The Tantur Ecumenical Institute in Jerusalem is sponsored by the University of Notre Dame and provides a variety of Continuing Education Programs for Christians so that they might encounter the richness of the Holy Land. 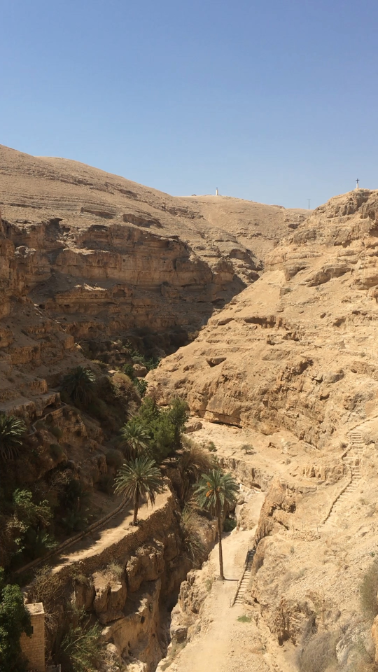 They offer month long summer programming, and I was invited to join them for a day trip to St. George’s Monastery, followed by a hike through the Wadi Qelt, and renewal of Baptismal Promises at the Jordan River. It was a privilege to spend time with this small group of adults from Australia, New Zealand, England, and the United States. We departed Jerusalem early in the morning and drove through the Judean desert with Dan Koski, Tantur Institute’s Marketing and Communications Director, as our guide. We traveled along the desert road to Jericho. Our first stop was St. George Choziba’s Monastery in Palestine, a picturesque sixth century Greek Orthodox monastery which is dramatically perched in the cliffs of a canyon. For centuries, many Christians, especially Orthodox, have venerated this site because of four primary reasons. First, this is the site where Greek Orthodox Christians have venerated Elijah’s cave. Secondly, it is the site where Sts. Joachim and Anna prayed for a child after years of infertility. Third, it is the site where St. George Choziba’s example lead to a flowering of Eastern monasticism. Finally, it is the site where St. John Jacob the Romanian is buried, the most recently recognized Orthodox Saint. Our group departed from the bus and hiked down a narrow path which lead to the monastery. The monks there greeted us and let us pray in the chapel and cave. Although we did not get to experience their liturgy, it was a gift to see the space and think about the generations of people who have been enriched by the witness of the lives of these monks. This monastery was built here because there was a supply of water from the wadi (a channel or river) that runs through this valley. So, on our departure from the monastery, we prayerfully read Psalm 23 and proceeded on a silent hike through the valley of the shadow of death. The two-hour hike through the Wadi Qelt was not for the faint of heart. The sweltering July sun, narrow paths, loose rock, and steep cliffs, provided a contemplative ambiance which lead to prayer. “Even though I walk through the valley of the shadow of death, I fear no evil; For thou art with me; Thy rod and thy staff, they comfort me.” Jesus’ forty days in the desert must have looked something like this, except for the fact that he wasn’t greeted at the end with an air-conditioned bus. We drove through Jericho and stopped for a short visit to Saint Gerasimos Monastery, another monastery in the Judean desert. Then we proceeded to Qasr El-Yahud, the Baptismal Site of Jesus. Although there are a few locations along the Jordan River where Christians remember Jesus’ baptism, Qasr El-Yahud is the oldest one. It was essentially closed from 1948-2012 because it was a closed Jordanian then Israeli zone which was only opened annually for the Feast of the Baptism of Our Lord. The Israeli side is working on de-mining area and the Jordanian side has provided state land for each of the Churches. Although this site was a heavily guarded international border with soldiers on both sides, it was a fairly peaceful place to have our lunch and pray together. The Jordan River looks more like a muddy creek and many Christians come here to be baptized or renew their baptismal promises. Our group waded into the water and renewed our baptismal promises. As we watched the other groups, I knew that wading in the water was not quite enough for me. I’m not sure when I will be able to return to this spot, so I decided to jump right in. I swam out into the water and dunked my head other the cool water. The water felt so wonderful after our hike and the warm sun quickly dried my clothes. Tantur provided towels for us and I was so glad experience this site with other pilgrims. Each one of us receives our call to holiness through our baptism, and the excursion to the monasteries, the desert, and the Jordan River with the Tantur Ecumenical Institute was a day full of grace. It was such a gift to join them for this experience! Sign up for our mailing list to receive news and updates. © 2018, Rose Coleman. All rights reserved. Photo Credits. Design by Inscape.